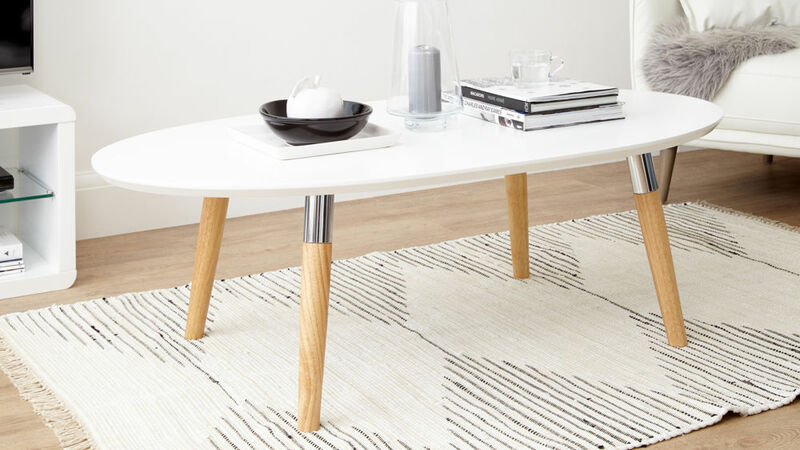 The Luka Coffee Table has a Scandinavian, mid century feel to its design but with a contemporary twist. 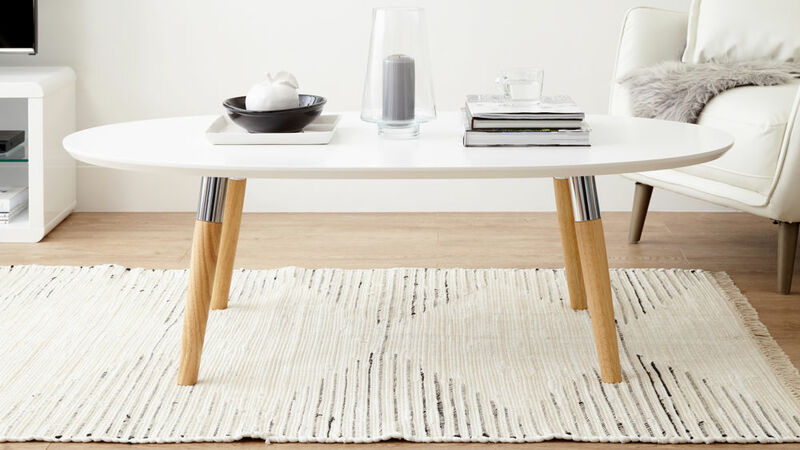 The top is matt white with a slightly satin sheen while the table legs are a sleek combination of chrome and oak. A practical, generously sized coffee table, the Luka would be an ideal accompaniment to a corner sofa or open lounge setting. The stand out feature of the Luka Coffee Table has to be its seamless blend of 3 mixed finishes. This not only gives such a designer edge to this modern coffee table, but it also makes this piece really easy to style and blend in with an existing scheme. The Luka measures 75cm x 135cm and is oval in shape. This clever sizing makes the Luka perfect for 'creating a space'; it fits well on a small to medium rug but would also work really well alongside a corner sofa. This makes it suited to a variety of spaces and settings in your living room interior. 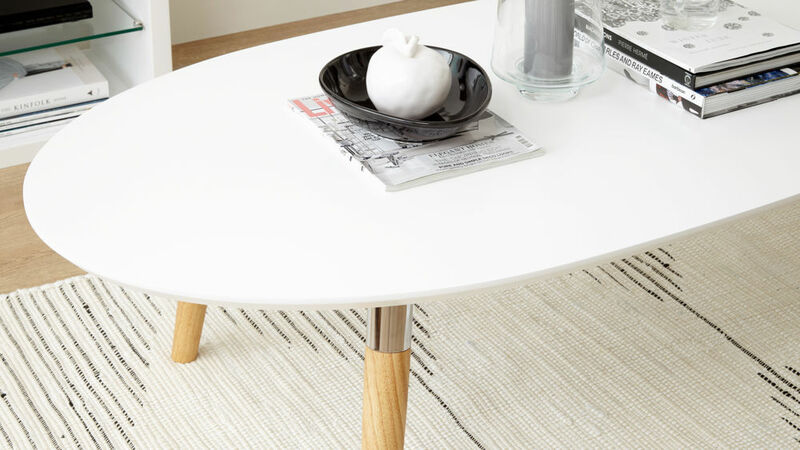 The Luka Coffee Table has a matt white finish with a slight satin sheen, rather than being highly reflective like gloss. The matt table top keeps the Luka looking and feeling smooth but with a real depth and tactile quality to it. The top of the table has a shallow chamfered top all the way around. This subtle detailing helps to keep the table top looking sleek and streamlined. 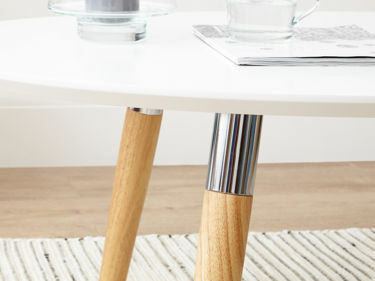 The oak legs are tapered and are set on an angle, with contrasting chrome detailing around the top of each leg. The angling of the table legs keeps the area underneath of the coffee table looking open and spacious while the chrome adds a crisp reflective shine. If you're looking for a coffee table that's sleek, well sized and very practical, the Luka Coffee table ticks all of the boxes! This coffee table is a stand out piece on its own but the mix of finishes also make it incredibly easy to style alongside your existing space, adding a truly modern flair. If you like the Luka Coffee table, we have a whole range of Luka products for you to create a contemporary and coordinated look throughout your home. The mix of finishes on the Luka gives this coffee table such an interesting and tactile appearance. 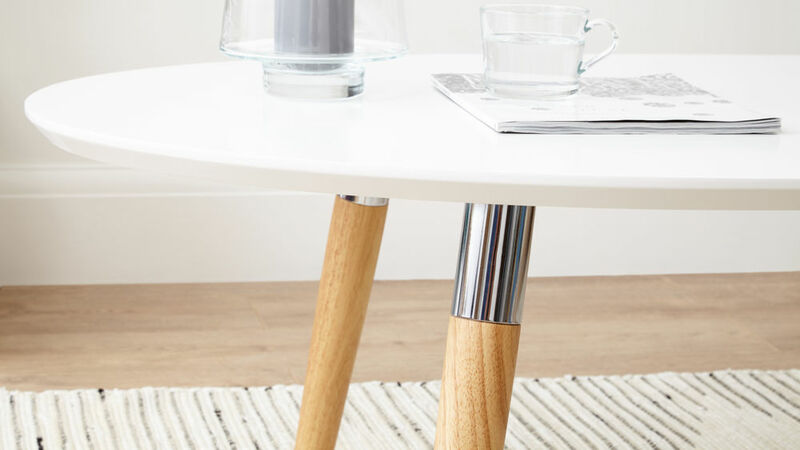 The oak legs and chrome detailing, combined with the slim matt white table top, make this coffee table a modern piece with a hint of nostalgic style. The great thing about having a combination of such sleek finishes is that the coffee table not only looks great on its own, but it can be used as a style staple for the rest of your interior. For example, you could match the chrome and matt surface of the Luka with a coordinating TV table. Then, you could style the oak table legs alongside matching Eames Style Dining Chairs or our Dice Oak Side Tables. Finish the look with a cosy chair, such as the Wing Occasional Armchair, for a casual and comfortable living room setting.